Heavy Duty Dog Crate here. It’s as cute as it is functional. That’s our strongest heavy duty dog crate for your smaller strong dog 30” Level 2. When I think of “strong dogs” I usually think of the larger breeds. This is not entirely accurate. If you have a smaller strong dog you know that dog crates can be a problem. NOTE: We no longer carry the 30″ Heavy Duty Dog Crate Size but we have lots of other sizes of heavy duty dog crates right here to serve you and your pets. Separation Anxiety or other canine anxiety issues need a heavy duty dog crate for management of the problem. Get it under control. Start with our strongest heavy duty dog crate. Sometimes they chew the crate and pan. Sometimes they manage to push the door open a bit which gives them an idea. “Hey, if I push on this a bit more and jiggle that thing there, I could escape.” And many do. Our 30” Level 2 heavy duty dog crate has a tubular steel metal frame which supports upgraded steel wire for sides, bottom, top and door. Your smaller strong dog can be put into his/her heavy duty dog crate by lifting the top or through the door on the front of the crate. This is a commercial quality heavy duty dog crate. The Level 2 30” heavy duty dog crate comes with 4 wheels. For their comfort and security you can easily move your smaller strong dog anywhere in the house to include them in the family or “pack” at all times. Our pricing is less than some wire cages. Take a look at our heavy duty dog crates and I’m sure you will agree that you will receive excellent value for the price. A dog crate is not a jail. It should serve both your dog and your family. Overuse of the crate may cause its own set of problems. While your dog will appreciate having their own “den” they will not appreciate being in the crate over 8 hours and typically, trainers teach that we should try to limit their crate time to 4 hours. But, life happens. I’m simply making the point that the heavy duty dog crate, while a problem solver in itself, is not meant to become a jail for your beloved pet. 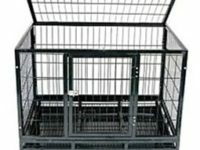 For wire dog crates your dog should be able to turn around in the dog crate even as an adult dog. With heavy duty dog crates you can use a size that offers more room for your dog unless your are crate training a puppy. If you would like more information please read my article entitled Heavy Duty Dog Crates-A misunderstood Solution to a Big Problem.